Can a ride in Hilversum explain why I don’t own a car? 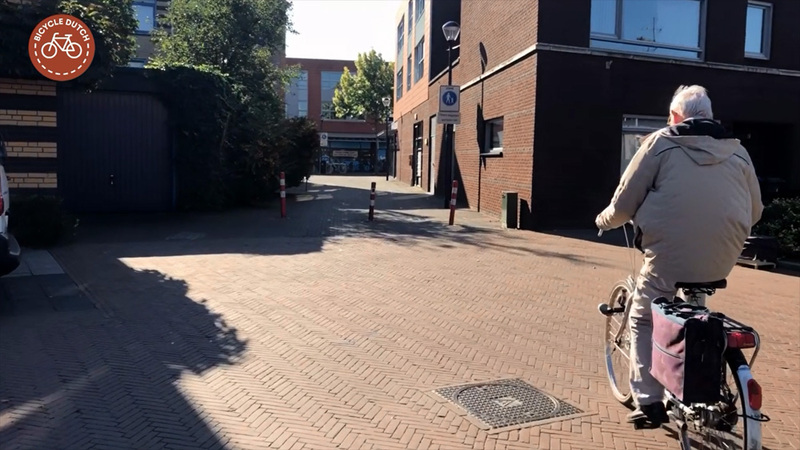 When I had a meeting on a location in Hilversum the other day I went by bicycle. Hilversum is about 70 kilometres (about 43 miles) from my home but that is no problem in the Netherlands. We have a good Public Transport system in place. Meaning the bulk of the trip was in a train and the final part on a bicycle that was provided by the shared bike system run by the railways. 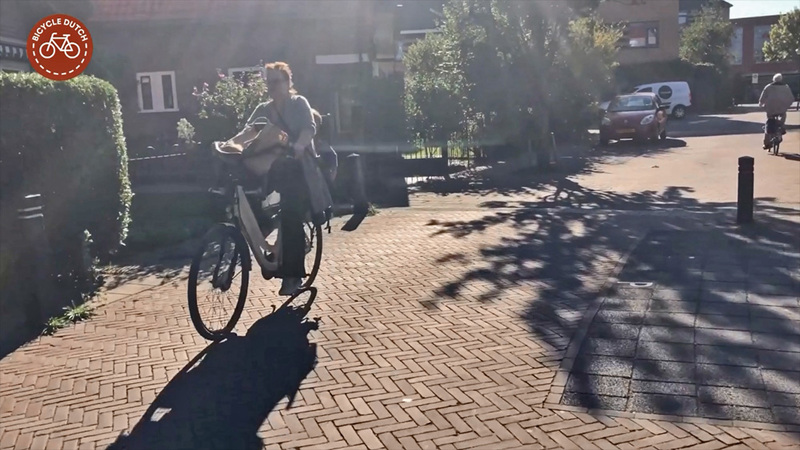 So the ride in this week’s post is again a “real ride” beginning at the station of Hilversum and going to an address in Hilversum on a shared bicycle. The name Hilversum might ring a bell with some of you. It is the place where all Dutch radio and television stations are based. You could find the name Hilversum on older radio dials for instance and – probably more well-known today – it is where the jury calls from at the Eurovision Song Contest. The sloping square at the back of the railway station in Hilversum. 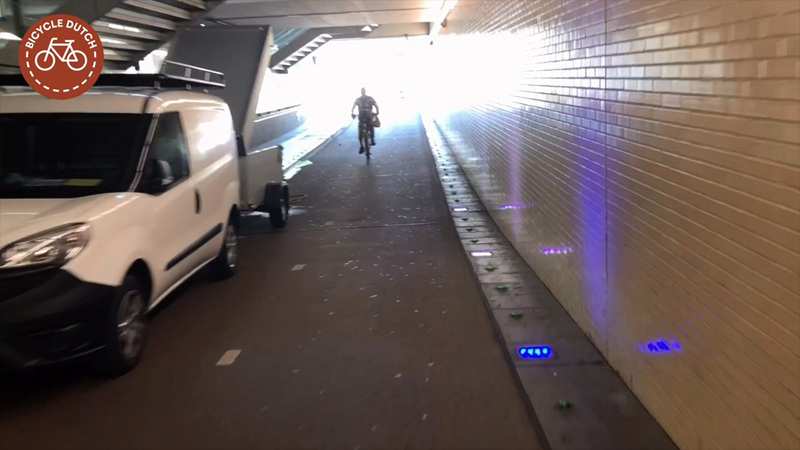 The cycleway goes through a tunnel under the tracks to the city centre side. It is also the access to the bicycle parking facility with the rental bikes. We Dutch keep forgetting that what is so normal to us leaves some visitors with a feeling of being ‘blown away’. Most Dutch have a Public Transport card (OV-card). Swiping my card allows me to pay for both the train fare and the bike rental OV-Fiets. OV-card is a stored value card which is valid in the entire country in the trains from any operator and all buses, also the local city buses, in any city in the country. On top of that it is automatically charged from my connected bank account. Whenever the stored value reaches a certain minimum it will charge automatically with an amount that I agreed upon without me having to do anything. This means I never have to think twice about using the card, it is always ready to use. On my own website page of OV-card I can see what trips and payments I made, virtually real-time. Since I have a subscription with the railways I can even correct a forgotten “checkout” on that page. Although I wouldn’t know how to, I have never forgotten to swipe the card at checkout yet. Start of my ride in the tunnel under the railway tracks. The white van is owned by window cleaners who were cleaning the glass wall (left) in the tunnel and who needed the water tank attached to the van. Not very nice that they’re parked there, but thanks to the width of the path it was okay enough to pass the parked contraption. Let’s compare my travel time with that of a hypothetical car (because I don’t own one, so it is not really an alternative to me). The full 70km trip by car would be 50 minutes (according to the route planner by ANWB, not counting congestion time or parking time). So in reality it would take about 20 minutes more, seeing that the nearest parking space from my home would already be a 5-minute walk, I would have to pass busy Utrecht in traffic and at the end destination parking would also not be possible in front of the building. Meaning I would have to circle the area to find a spot and then walk to the end-destination. The train ride itself takes 49 minutes. I need to walk 8 minutes to the train station and I need to be 5 minutes earlier at the station to catch the train on time. The bike ride is 1.3km or 5 minutes and there are the 3 minutes to get from the train to the bike. All that makes the car trip a total of 1 hour and 10 minutes and my bike-train combination the exact same total of 1 hour and 10 minutes. I consider the latter to be much more convenient, especially since I can do other things those 49 minutes on the train which I wouldn’t be able to do while driving. Coming from the station square you have priority over car traffic when you want to continue straight on over the intersection Kleine Drift / Zuiderweg. Many people who drive by default, even in the Netherlands, don’t know that when you live at walking distance from an intercity train station the time trips take by train are most often very comparable to the car trips. The larger the city I have to go to, the more competitive the time becomes. I can reach the centres of Utrecht and Amsterdam much faster by train than by car. Now more than ever, since the intercity trains run every 10 minutes to these cities. This explains why I have never owned a car, but for one year when I was 19. When I calculated the cost for that car and the “benefits” it gave me I quickly got rid of it. Instead of buying a car I made sure I bought a home at walking distance from an intercity station and I never regretted that decision. 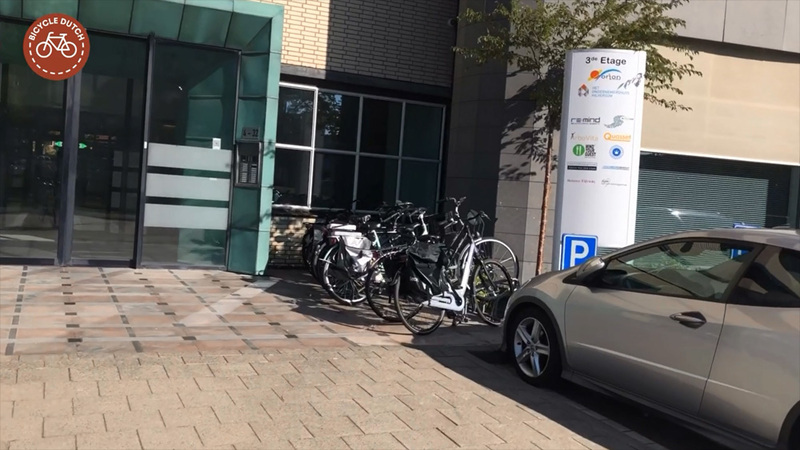 The picture captions in this post describe the ride in Hilversum, as shown in the video at the end of this post. 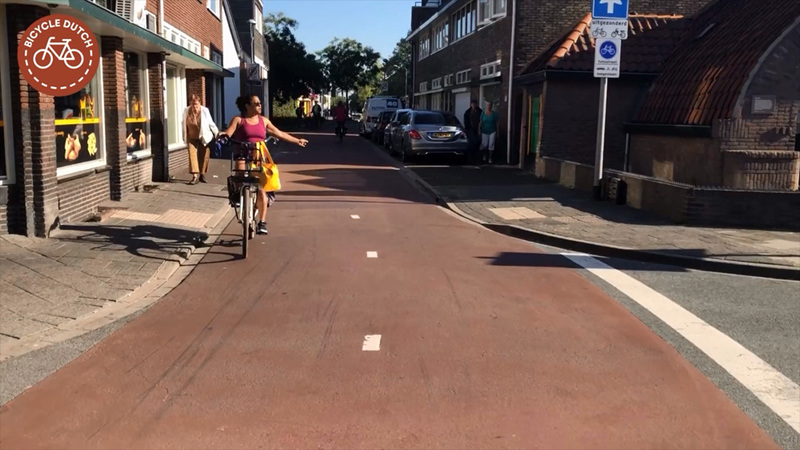 The first part of Zuiderweg is a cycle street where cars are guest. Cycling always makes it possible to stop and chat to a friend who you happen to pass. Try that in a car! The south part of Larenseweg has very strange cycling infrastructure. This is what the Germans call cycling on the sidewalk. There is no height difference between the cycle path in red and the footway in gray. 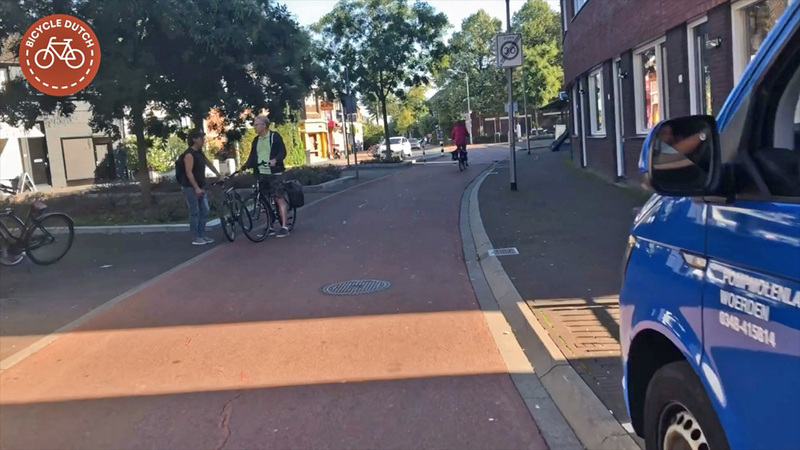 I don’t know any other example in the Netherlands where the cycleway feels so much like being on the sidewalk. That there is an alternative to such design, even in narrow streets, becomes clear in the next pictures. 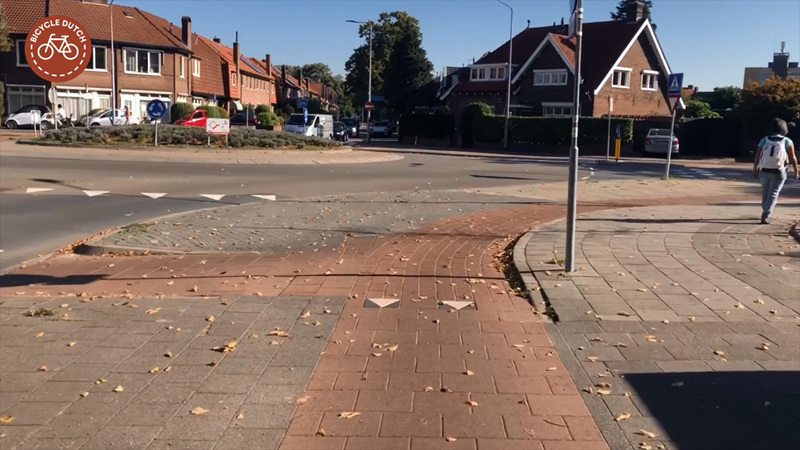 Approach to a small roundabout in a residential area (Larenseweg/Jan vd Heijdenstraat). From here there is a kerb (curb) and thus a height difference between the cycleway and the footway. It immediately feels less like you cycle on the pavement (sidewalk). Two people come from the right here but would have had to give way to me because I am already riding on the roundabout. (Hence the sharks’ teeth in the surface.) Neither gives me priority because they would both have had to come to a full standstill while everybody could keep going when I just put on the brakes slightly. Of course I did that. 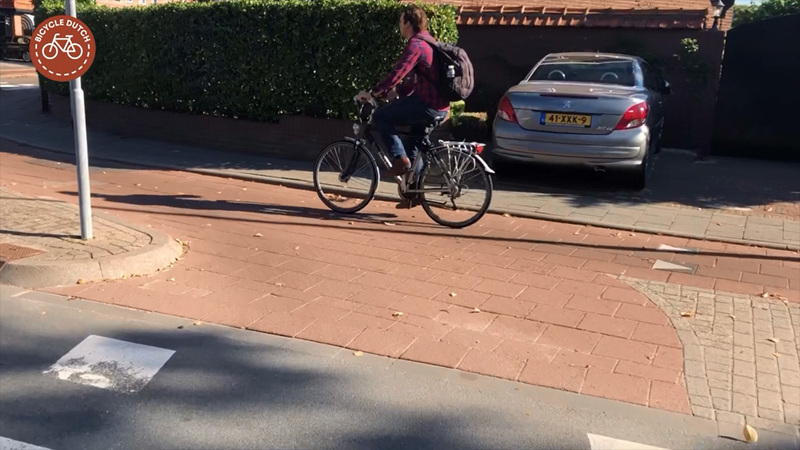 Dutch people who cycle will always bend the rules in a way that everybody can keep going. This unwritten rule to keep everyone riding is much more important than the written traffic rules. Negotiating this is done with eye contact and body language. On the other side of the roundabout the cycleway continues as a bi-directional cycleway on the “wrong side” of the street. That means I have to cross the roadway first before I can take a right turn here. 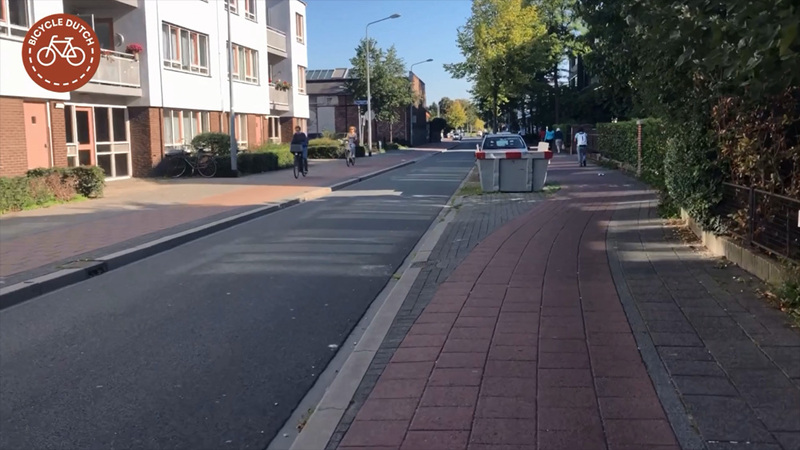 A more modern solution than the “on-sidewalk” cycleways in the south part of the street (Larenseweg) is this bi-directional cycleway of a good width and with smooth red asphalt. Note that the roadway has a speed bump, not present on the cycleway. 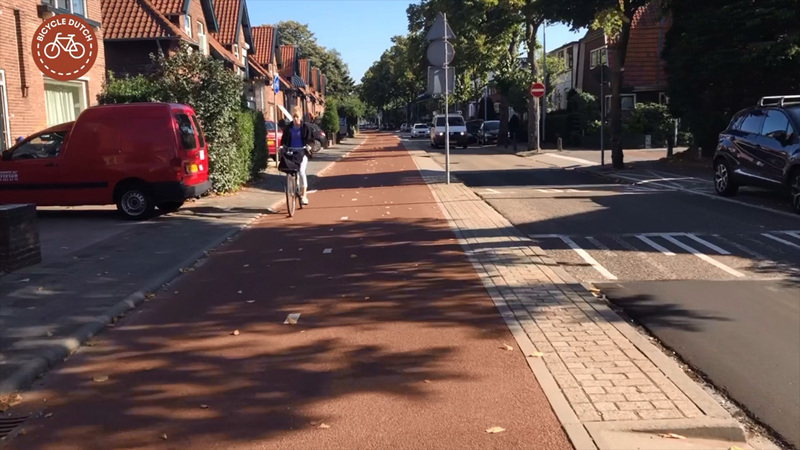 Having a bi-directional cycleway on one side of the road has the disadvantage that you have to cross the roadway more often (twice more in this particular ride) but I personally like this better than the example in the south part of this street from the earlier pictures. It is wider and it is easier to overtake other people cycling. 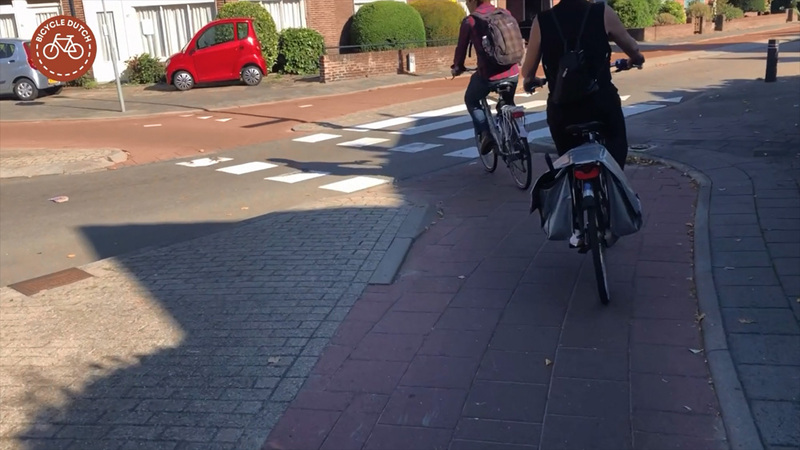 After the right turn from the bi-directional cycleway I turned into a residential area (Ripolinstraat) where the volumes are low. That means no separate cycle infrastructure is necessary. 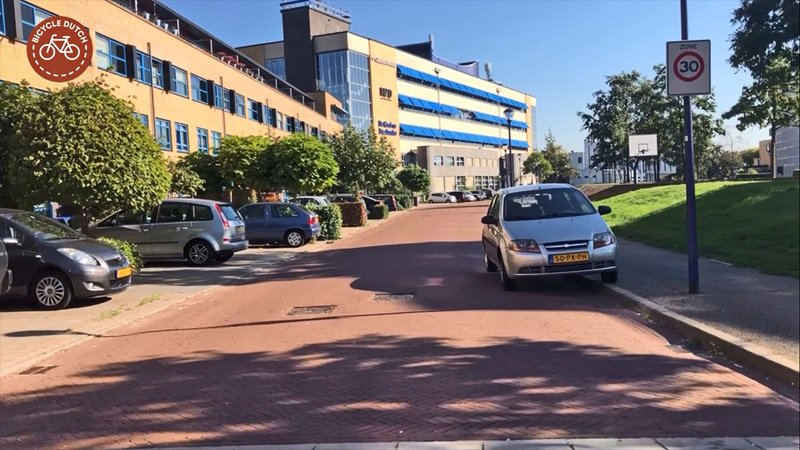 In this case there is virtually also no specific infrastructure for walking which gives away that this is a so-called “Woonerf” meaning “living yard”. The speed limit was long “walking pace” for such zones but the EU forced the Dutch to put a number on that and it became 15km/h or just over 9 miles per hour. The ride takes me a short bit from the living zone into a pedestrian zone (Ripolinpad). But the sign says cycling is permitted, riding a moped/scooter is not. The end destination is that larger building in the distance. It is in a residential street with sidewalks (Seinstraat) where the speed limit is again 30km/h. Hence no cycling infrastructure. This building is the seat of a number of businesses. There is a rack to park your bicycle right next to the front door. Once again a very convenient ride; relaxed and uneventful. Map with the ride I just described. As you can see I cycled across a large part of the town from the centre to almost the edge in 5 minutes. That is how small most towns in the Netherlands are. My “real” ride in Hilversum. From the station to Seinstraat in the north-east. 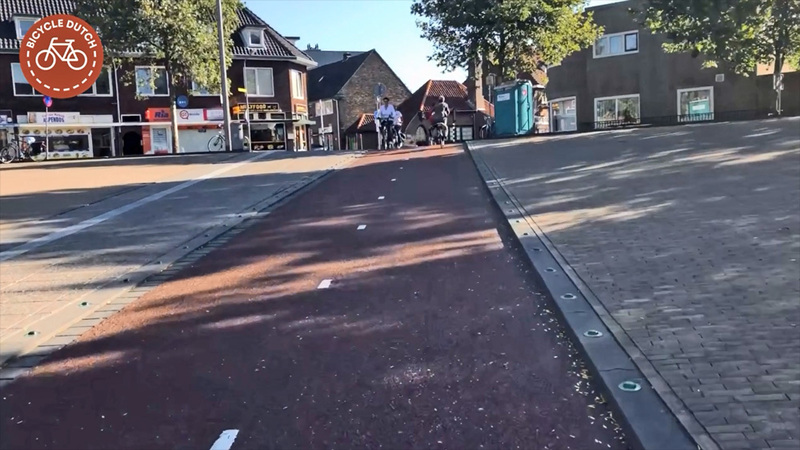 There are a few streets in Bergen op Zoom and Den Helder that have sidewalk-like bicycle paths. But it also looks to be very old infrastructure. 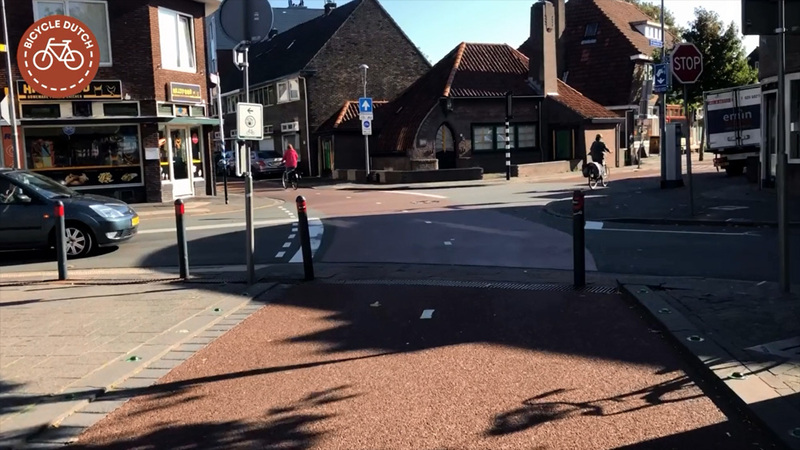 At least in Bergen op Zoom, they seem to be gradually updating the infrastructure. I don’t get such an impression from Den Helder, which strangely also routes all the traffic going towards the ferry to Texel through the city center. This is probably the most mediocre city I’m seen in regards to bicycle infrastructure. In general, I’m super impressed with the high speed and quality in which roads are reconstructed in the Netherlands. There are already 6 instances now where I initially thought a certain section or area could/should be improved, and then such a change happened within months! I have clients offer to pick me up in their cars to “save me the trouble of cycling”. One recent one was literally a five minute bike ride away, another one would have cost them a 2 hour drive, compared to me cycling for 3 hours; I don’t see the time-saving logic when it comes to fresh air, exercise, and saving money. Just curious, why do you need to live within _walking_ distance of an intercity station — Would being within cycling distance of an intercity station (with adequate parking) not serve as well? That’s why such things should be taught at school. That would take many cars of the streets and would save people unnecessary problems. 10 minute frequency! I live in a city of 160,000. There is a train to Los Angeles and the closest trains are 3:44 AM and 4:46 AM (yes it’s AM, not PM). Even worse is if you miss the 1:45pm train here, you have to wait until 6:17pm for the next (and last) train of the day. The drive to Los Angeles is only 90 minutes. No wonder California has the highest asthma rate in the US. Hiya, at present the UK government has suspended housebuilding projects where there is no footway and no kerb in culs de sac after protests from the blind and partially sighted lobby. 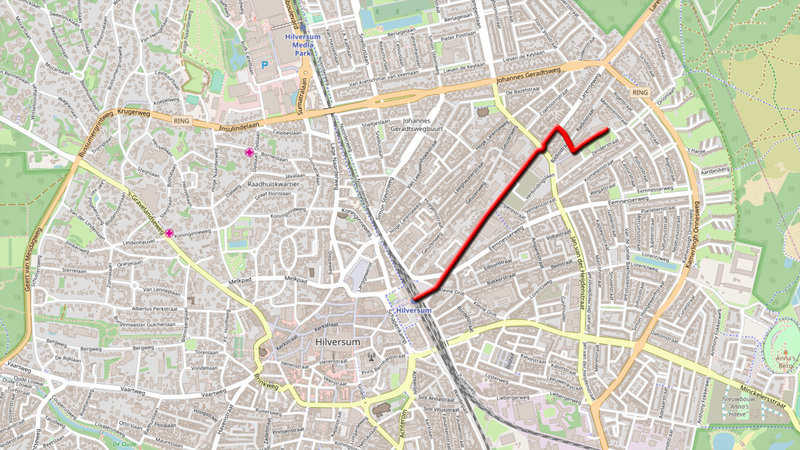 The sort of road affected is equivalent to a woonerf, with very low traffic levels. How do you get over this problem in NL? One way to retain the footpaths is to have short culdesac with only a single lane for traffic, it is less space efficient than shared space but easier to designate parking. 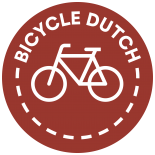 This entry was posted on 25 September 2018 by Bicycle Dutch in Original posts and tagged Hilversum, railwaystations, ride.